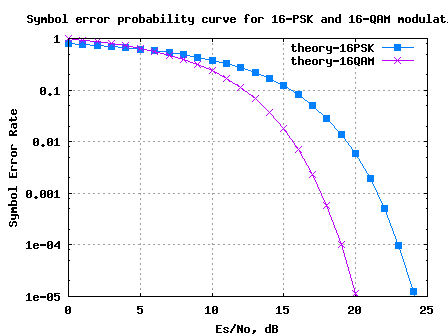 In this post, let us try to derive the symbol error rate for 16-PSK (16-Phase Shift Keying) modulation. As can be seen from the figure above, due to the addition of noise, the transmitted symbol gets spreaded. However, if the received symbol is present with in the boundary defined by the magenta lines, then the symbol will be demodulated correctly. To derive the symbol error rate, the objective is to find the probability that the phase of the received symbol lies within this boundary defined by the magenta lines i.e. from to . (a) The signal to noise ratio, is reasonably high. 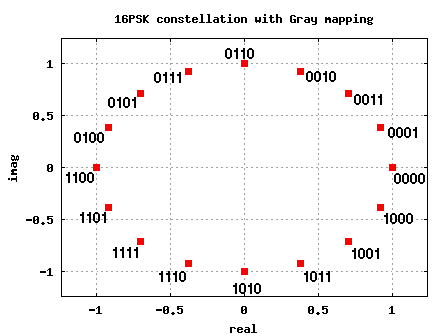 the imaginary part of the received symbol is equal to noise, i.e. 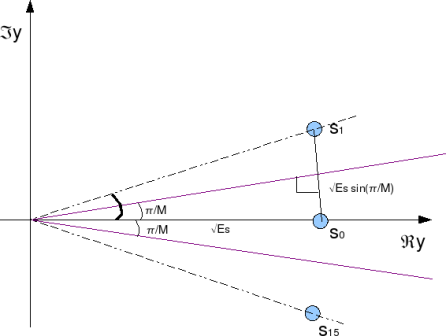 For a reasonably high value of M, the constellation points are closely spaced. Given so, the distance of the constellation point to the magenta line can be approximated as . Note: The complementary error function, . 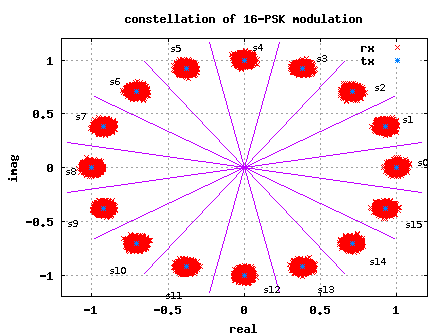 Simple Matlab/Octave script for simulating transmission and recepetion of an M-PSK modulation is attached. It can be observed that the simulated symbol error rate compares well with the theoretical symbol error rate. Please click here to SUBSCRIBE to newsletter and download the FREE e-Book on probability of error in AWGN. Thanks for visiting! Happy learning. D id you like this article? Make sure that you do not miss a new article by subscribing to RSS feed OR subscribing to e-mail newsletter. Note: Subscribing via e-mail entitles you to download the free e-Book on BER of BPSK/QPSK/16QAM/16PSK in AWGN. please help me by giving me the Symbol Error Rate (SER)/ Bit error rate formula/Equation for 16-APSK modulation. because i need the theoretical equation for plotting and compare simulation result. I want to develop a MATLAB code for MIMO using MMSE equalizer for 4X4 antenna configuration and using BPSK, QPSK and 16-QAM modulation. Suggest me any MATLAB code for reference. I hope you will reply me. Why did you use N=10^5 a big number? @NH: To get a good average in symbol error rate…. i m doing b.tech in ece branch from bit mesra. i need a code for finding symbol error rate of bfsk signal in presence of additive gaussian noise. please help me out in this. @abhijeet: Does this post on frequency shift keying with coherent demodulation help? to express the amplitude levels (-3, -1, 1, 3). I would appreciate if someone could lend me a hand in this problem. @Moongeun: To round the received phase to the nearest constellation point. of 16PSK. Your system will be tested over the AWGN Channel. · Show that you are able to identify and use technical references. But for now am learning MATLAB and the problem is giving me though time, i wish you can help me by putting me through with the rest apart from the MATLAB. Please sir i need your help. 1. You can subscribe to the email newsletter by providing you email address in the form on the top right of the page. Email subscription will entitle you to receive the free e-book on error rates in AWGN. 2. Further, you can join via Google FriendConnect option provided in the bottom of the page. Google FriendConnect enables you to share the contents of this blog to your friends/colleagues in an easier fasion. @gautam: Maybe you can try modeling the transmitter, receiver and channel per the 3GPP LTE specifications? It includes MIMO, advanced coding scheme, OFDMA etc. Quite a lot to learn. 1. If the device is non-linear, one would expect that the signal at the output will have more frequencies than the signal at the input (generation of harmonics dye to x^2, x^3 terms etc). The out-of-band frequencies maybe filtered out, however nothing much can be done about the harmonics in the in-band. It may be that the measured power includes both out-band and in-band harmonics (along with the desired signal power), hence the C/N does not degrade. However, since the in-band harmonics are not deisrable for demodulation, there is degradation in the MER. 2. When you say ‘devices not matched’, I would think that you are referring to impedence mismatch between the devices (resulting in reflection…). May I suggest the generation of in-band and out-band frequencies due to impedence mismatch as a probable reason for MER degradation. Thanks for the reply. While you are right, however we will have to add the noise level. Now the noise level at room temp will be about 3 dBuV while that for QPSK with MER of 15 dB at Signal strength of 86dBuV will be approx 71 dBuV. So that the additive White noise is negligible. We also find that C/N does not get deterioted as we pass thru varios devices. However we have noticed that MER doe reduce by 0.7-1.0dB. 1. If thye device contains diodes then if at the point of operation diode is non linear it can add to the reduction of MER but not of C/N. How MER is related to non-linear CSO and CRB. 2. If the device is poorly matched then agian MER measurement will get affected. How does the mismatch between the device and the instruments affects the MER? error is the distance between the transmitted and received constellation. Y = S + N, where S is the transmitted symbol, N the noise. 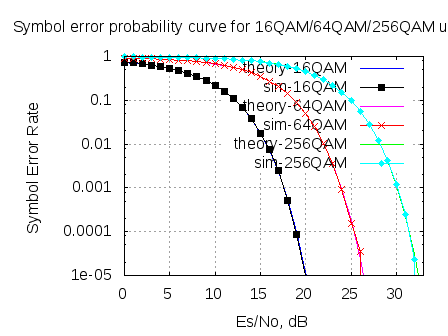 then error = Y-S = N.
From the above equation, it is reasonably intuitive that modulation error ratio (MER) is comparable to signal to noise ratio (SNR) in noise only scenario. In the presence of other impairments, MER will reflect the distortions in the constellation due to phase noise, IQ imbalance, frequency offset etc. power. Did I interpret correctly? Did the linear addition of two noise components, do you agree? 1. The symbol error rate should also be related to Modulation Error Rate (MER). Since MER is what most Meters measure a correlation will be most helpful. 2. Most of the signal are distributed over a network. What one also needs is the MER impairments due to network elements. For example if the signal is split into two parts. That splitter will have an insertion loss which will have a spatial component. For example a 2 way lossless splitter will reduce the signal and noise by 3 dB and hence will not impair the signal. However there is an associated resistive loss aboput 1 dB. How much will the MER deteoriate? (b) for power signals use 10*log10(). (a) for scaling noise, which is a voltage signal, I used the 20*log10(). (b) for finding the theoretical symbol error rate, the Es/No in dB (which is signal power by noise power), the conversion used is 10*log10(). In your simulation, you have added noise voltage/level i.e taken 20log10(ns) whereas for calculating theoretical BER , you have used noise power. (10log10(ns^2)). I always tend to get confused between these. Do you know any study material clarifying these and some examples? @mahesh: true. Infact in the transmit and receive chain, there are various sources which can introduce DC (LO leakage etc). Given so, it makes it difficult to recover information present on DC subcarrier. @ Rajesh, How do you get sync information from DC? well, typically dc subcarrier is not used (as far as I have seen). Can you please point to the section in the spec (and the spec version). hi i am doing M.E wireless tech. now i am doing my final sem project is implimentation of synchronization algorithem for wimax ieee 802.16e standard. No content on this site may be reused in any fashion without written permission from http://www.dspLog.com.